Reducing felt recoil by up to 70 percent, the advanced LimbSaver AirTech Recoil Pad is available as a slip-on option for most rifles, shotguns and muzzleloaders. It features advanced atmospheric chambers that produce a substantial increase in performance through uniform energy dissipation, and it incorporates anti-muzzle jump technology for faster target re-acquisition. Reducing felt recoil by up to 70 percent, the advanced LimbSaver AirTech Recoil Pad is available as a slip-on option for most rifles, shotguns and muzzleloaders. It features advanced atmospheric chambers that produce a substantial increase in performance through uniform energy dissipation, and it incorporates anti-muzzle jump technology for faster target re-acquisition. The recoil pad helps increase accuracy of follow-up shots and you&apos;ll enjoy increased control for maximum stability. Designed to easily slip over existing firearm stocks without any modifications, the AirTech Recoil Pad will work best with removing the current factory recoil pad before installation. The AirTech Slip-On can be installed directly over the factory recoil pad to increase the length-of-pull by 1 inch (LOP), but to achieve optimum performance, LimbSaver recommends the removal of the existing factory recoil pad. 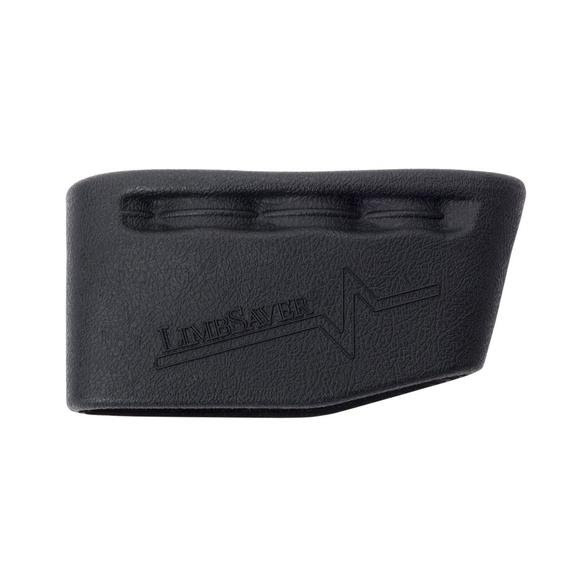 It&apos;s made from LimbSaver&apos;s proprietary NAVCOM technology (Noise and Vibration Control Material), which effectively absorbs a wide range of frequencies to dissipate energy and vibration. This recoil pad also features a no-slip surface that stays in place even in the rain. Increases length of pull by 1"
Large fits stocks measuring 5-1/8" x 1-3/4" to 5-3/8" x 1-7/8"
Measurements Large: 1" fits stocks measuring 5-1/8" x 1-3/4" to 5-3/8" x 1-7/8"